Rice University atomic physicists have verified a key prediction from a 55-year-old theory about one-dimensional electronics that is increasingly relevant thanks to Silicon Valley's inexorable quest for miniaturization. "Chipmakers have been shrinking feature sizes on microchips for decades, and device physicists are now exploring the use of nanowires and nanotubes where the channels that electrons pass through are almost one-dimensional," said Rice experimental physicist Randy Hulet. "That's important because 1D is a different ballgame in terms of electron conductance. You need a new model, a new way of representing reality, to make sense of it." With IBM and others committed to incorporating one-dimensional carbon nanotubes into integrated circuits, chip designs will increasingly need to account for 1D effects that arise from electrons being fermions, antisocial particles that are unwilling to share space. The 1D implications of this standoffishness caught the attention of physicists Sin-Itiro Tomonaga and J.M. Luttinger, whose model of 1D electron behavior was published in 1963. A key prediction of Tomonaga-Luttinger liquid (TLL) theory is that exciting one electron in a 1D wire leads to a collective, organized response from every electron in the wire. Stranger still, because of this collective behavior, TLL theory predicts that a moving electron in 1D will seemingly split in two and travel at different speeds, despite the fact that electrons are fundamental particles that have no constituent parts. This strange breakup, known as spin-charge separation, instead involves two inherent properties of the electron — negative charge and angular momentum, or "spin." In a study online this week in Physical Review Letters, Hulet, University of Geneva theoretical physicist Thierry Giamarchi and their colleagues used another type of fermion — ultracold lithium atoms cooled to within 100 billionths of a degree of absolute zero — to both verify the predicted speed that charge waves move in 1D and offer confirmation that 1D charge waves increase their speed in proportion to the strength of the interaction between them. "In a one-dimensional wire, electrons can move to the left or to the right, but they cannot go around other electrons," said Hulet, Rice's Fayez Sarofim Professor of Physics. "If you add energy to the system, they move, but because they're fermions and can't share space, that movement, or excitation, causes a kind of chain reaction. "One electron moves, and it nudges the next one to move and the one next to that one and so on, causing the energy you've added to move down the wire like a wave," Hulet said. "That single excitation has created a ripple everywhere in the wire." In their experiments, Hulet's team used lithium atoms as stand-ins for electrons. The atoms are trapped and slowed with lasers that oppose their motion. The slower they go, the colder the lithium atoms become, and at temperatures far colder than any in nature, the atoms behave like electrons. More lasers are used to form optical waveguides, one-dimensional tubes wide enough for just one atom. Despite the effort needed to create these conditions, Hulet said the experiments offer a big advantage. "We can use a magnetic field in our experiment to tune the strength of the repulsive interaction between the lithium atoms," Hulet said. "In studying these collective, or correlated electron behaviors, interaction strength is an important factor. Stronger or weaker electron interactions can produce wholly different effects, but it's extraordinarily difficult to study this with electrons because of the inability to directly control interactions. 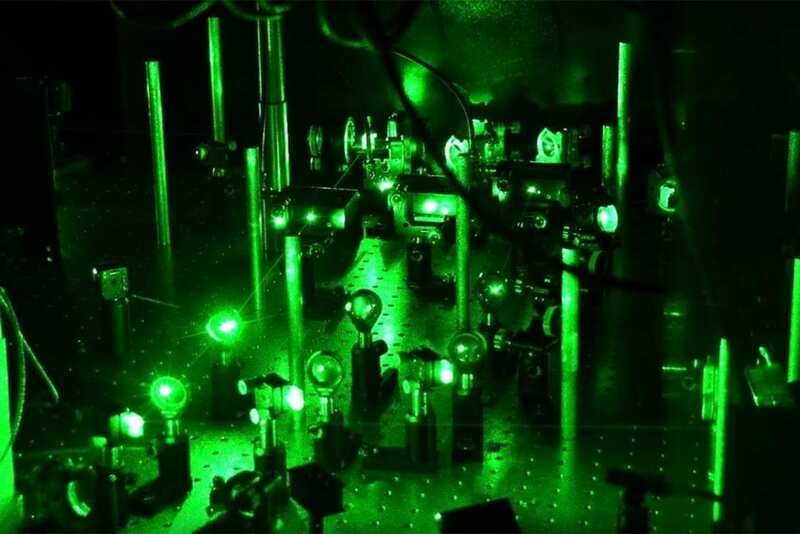 With ultracold atoms, we can essentially dial the interaction strength to any level we want and watch what happens." While previous groups have measured the speed of collective waves in nanowires and in gases of ultracold atoms, none had measured it as a function of interaction strength, Hulet said. "Charge excitations are predicted to move faster with increasing interaction strength, and we showed that," he said. "Thierry Giamarchi, who literally wrote the book on this topic, used TLL theory to predict how the charge wave would behave in our ultracold atoms, and his predictions were borne out in our experiments." Having that ability to control interactions also sets the stage for testing the next TLL prediction: The speed of charge waves and spin waves diverge with increasing interaction strength, meaning that as electrons are made to repel one another with greater force, charge waves will travel faster and spin waves will travel slower. Now that the team has verified the predicted behavior of charge waves, Hulet said they next plan to measure spin waves to see if they behave as predicted. "The 1D system is a paradigm for strongly correlated electron physics, which plays a key role in many things we'd like to better understand, like high-temperature superconductivity, heavy fermion materials and more," Hulet said. Hulet also is a member of the Rice Center for Quantum Materials. Giamarchi is a professor of condensed matter physics at the University of Geneva and a permanent member of the French National Center for Scientific Research. Additional study co-authors include Rice graduate student Ya-Ting Chang; former Rice graduate students Tsung-Lin Yang, the study's lead author, and Zhenghao Zhao; former Rice visiting student researcher Chung-You Shih; and former University of Geneva research scientist Pjotrs Grisins. The research was supported by the Army Research Office's Multidisciplinary University Research Initiative, the Office of Naval Research, the National Science Foundation and the Swiss National Science Foundation.